Is out of scope for you to use a TENS unit on your doula clients? Each doula training organization has its preferences. Below are a list of doula organizations I have personally contacted to see what their preferences are on with the use of TENS for labor, and their training preferences. If you don’t see your training organization, I would be happy to talk with them too! 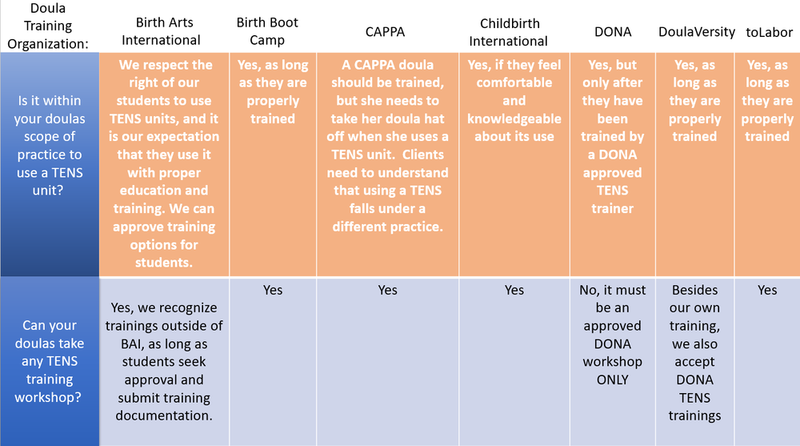 Questions I have asked your doula organization about the use of TENS in labor and attending a TENS training workshop. DONA doulas! I am working on getting this training approved. Some students have emailed DONA and gotten permission to take this course, so perhaps their stance is changing! Please verify before attending our training. NO REFUNDS are given after the start of your training.